I'm letting my neighbor jump on my wireless NW with her desktop PC (2yo DELL) with a wireless card. Her PC is miserably slow to dowload on the net. I pinged google and the connection "timed out" on occassion. My laptop never missed a ping. I disabled / enabled the wireless card and no difference. I would think the wireless card would either work or not work. These marginal things drive me nuts ! How close is you neighbor to your router? What is your router 802.11 A? G? N? 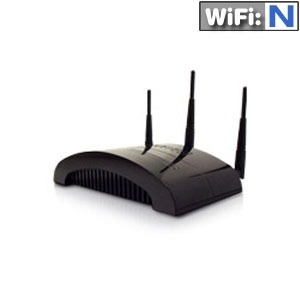 What is your neighbors wireless card 802.11 A? G? N? Is she trying to download while you are downloading something? Can you see how many "bars" strong she is? I hope she's good looking! No, "marginal" is definitely an issue with wireless signal. The answer could be as simple ad you moving your router a few feet closer or rotating it 90 degrees in any given axis. Also - her card might have a connector for an external antenna? Repeater is another option. I have used these in several installations. I haven't worked on wireless networks but on wired networks, the speed and duplex settings on the card can cause intermittent connection problems and slow performance problems. One card set to Auto negotiate when the router/firewall or modem only supports 10Mb 1/2 duplex can be a real problem. My laptop was beside her desktop and both had 3 bars, signal strength displayed good. The building is a duplex with a block wall between units. I'm thinking of swapping the wirless card. I use one of these external adapters. It work quite well. A typical wireless NIC just didn't do the job, Lots of slowness and dropped connections. Ah, we were missing that bit of info. Crappy card / antenna then. Instead of swapping the card, just plug in a $19-29 USB model. Might be helpful to use a USB extension cable with an external USB adapter. Sometimes this will let you locate the adapter in a higher better location than on the front of a PC under a desk. View Next Unread Youth Soccer- Help!